Every girls love good old fairy tales. Don't we? Most of us grew up with an impression of longing to have prince charming swept us on a horse and bring us to the big white castle with servants and butlers with all our friends the little mouse and the birds that help us sings every morning. Life would be so beautiful as step mama will have to pay one day and step sisters will be the ones that does our laundry instead. That's our happy ever after that we grew up with, we never question the questinable. Funny, when we all grown up we still longed for the happy ever after except that there's a few question linger in our mind like, "will our prince charming be charming enough?" or "will the bad people pay for what they've done to us?". My questions are always "How is happy ever after be now that Cinderella and Prince Charming are married?". "How the hell would their life be, they known nothing about each other!. The after "happily ever after" part is always an interesting discovery for me. When I got married to Fairuz and started to live together, I thought it was heaven on earth. We have a decent home, decent job and a very decent life. Little that I know that living with somebody is actually a way of really knowing somebody. Like the saying goes - If you want to get to know somebody, live with them (Note-This does not apply for unmarried muslim ya). Really it does. Since I am the elders in my 4 siblings, I've always kinda been the boss. Mom says I'm bossy but in my defend I just wanted to have everything in the right order. My right kind of colours, my right kind of style and my right kind of routine around the house. Have always been independent in boarding school in my childhood years is one of the contribution factor to my bossiness I guess. Mom says in my first day of school I didn't cry instead I've asked her to go home and leave me alone in the school. I love been independent and do a decision on my own ever since. While Fairuz? He has always been the only boy in his family. He didn't have to share anything with his girls siblings. He never was in boarding school although he was accepted in MRSM and RMC just because He didn't want to. And He sure never been told to do something He doesn't want in his life ever. So far all his decision have bring out the best in him. He kind of believe himself is the breadwinner. In his case not the money but the role model part. So when we started to live together, I have my kind of taste and he have his. It wasn't a surprise when we had our first argument there. I thought to myself, I never knew men can be really concern with the interior decorating of a house and whatever concerns it. So far mom have been the only person buying chairs and sofa and choose whatever bedsheet patterns to her liking. Dad just love to do his work. Most of all I never knew Fairuz have this side of him. I thought I knew everything about him but clearly there's a lot of reasons to get to know him better. And then there's this one time, I was tired of waiting for his 'sorry' after my sulking, I said "you've never said sorry to me if you done something to pisses me off". He let out a little chuckle and I thought that was insulting. "You've never said 'please' to asking me for a help or to do something" He said. It was like a slap in the face. So we learn that from each other and gradually I learn to say 'please' and he learn to say 'sorry'. Needless to say, after 1 whole years of living together there's loads of things, behaviors and habits that surprised me about Fairuz. If I were to mention all here there's no way I'll be sleeping tonight. So happily ever after wasn't after all a happy ever after with butlers and maids and little mouse and birds as friends. It's a reality where compromises, patients and team work involve. The endurance may sound exhausting. But I can tell you this, life has never been the same (in a good way). Along the way you'll discover something about your partner. It can be happiness, sadness and also sweetness of all things that make you love him even more everyday. Love is magical and enchanting. Now who needs Fairytales. Fairytales don't come true. Reality is so much more interesting than living happily ever after. eh saje je nak buat i kawen cepat kan??? p.s: u look cute in kimono. hehehe. cepat la ade anak...cepat la ada baby..cepat la cepat laa.. I know I will never be perfect as a person. But I do wish to be perfect for the husband. 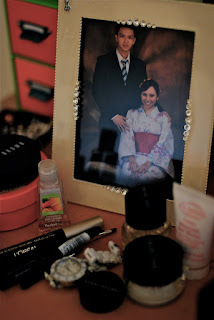 P/s: Can't stop noticing the kimono picture. Too cute lah! oki: lol. I didn't realized this post 'menyedarkan' orang. :) thank u though. jiji: lol tell story through experiences je pun :) thank u.
Lea: Haha kimono tu u perasan...u slalu perasan bende2 kecik..the spciality in girls i guess. jeff: kawin cepat kawin cepat...:P cptlaaaa kawin. Farah: LOL! ada orang jepun pakai kann masa wedding harituh! "Reality is so much more interesting"
This is the most interesting post that I've read about marriage. Kudos! Most probably coz I too would have fantasized the fairytale ending (bak kata bf, mcm dlm 27 dresses tu grrr~). But over the years, I've seen n learnt that it takes more than that to make it work, ain't that right? There's more roads to pass throughout the journey kan. I hope we can bring out the best of us 1 day (if ever I'm married). Eh, almost the same la, me as the 2nd child (acts like the 1st at most times) and him as the last 1. This can b a good preparation to us. Thanx!